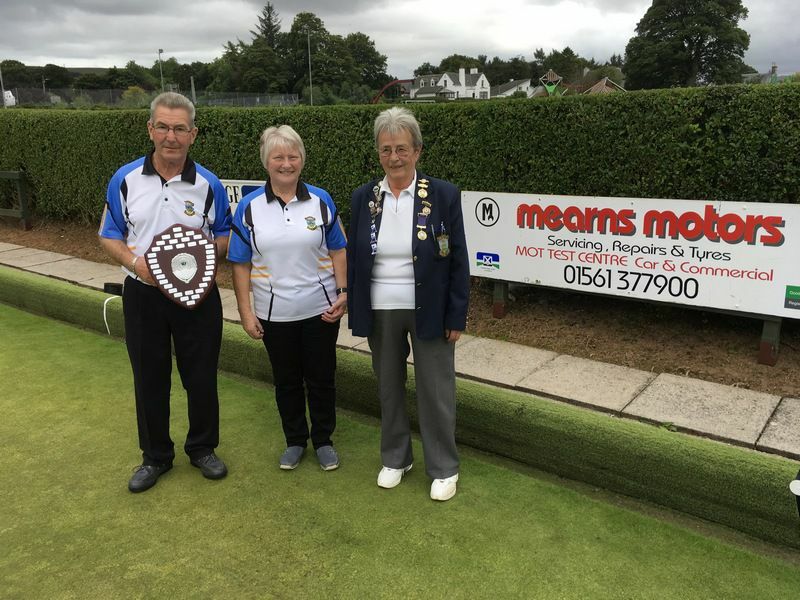 The Laurencekirk Bowling Club Charity 7 Ends Singles competition, sponsored by Ian and Fiona Greig of Mearns Motors Ltd, was held on Sunday 2nd September. 22 members and guests contested the Mearns Motors Shield in a knock out competition. The quarter finals were contested by seven Laurencekirk bowlers plus one from St Cyrus. Bill Russell, Frances Roberts and John Henderson of Laurencekirk made it through to the semi finals with Christine Jamieson of St Cyrus. In the first semi final, Frances beat Bill 5 – 4 in a closely contested game which needed an extra end to decide the winner. In the other semi final, John beat Christine 8-4. In the final, John raced to a 7-0 lead after 3 ends, but Frances staged a thrilling comeback by winning the next 3 ends to level the game at 7-7 going into the last end. John’s first bowl of the last end sat on the jack and managed to stay there despite Frances’ efforts to remove it, meaning that John won the final 8-7. John and Frances are pictured below with Club President Margaret McNicoll, who presented the trophy. The Club’s nominated charity for the year is the Anchor Unit at Aberdeen Royal Infirmary, and the charity will be receiving a cheque for the total amount raised of approximately £400.